This mini basketball game is a themed version of Tiki Toss. Creator Kyle McGetrick originally made a Tiki Toss smartphone game, and fans loved it so much they asked him to create the real thing. This is a simple, addictive game for parties, barbecues, and other gatherings—indoor or out. 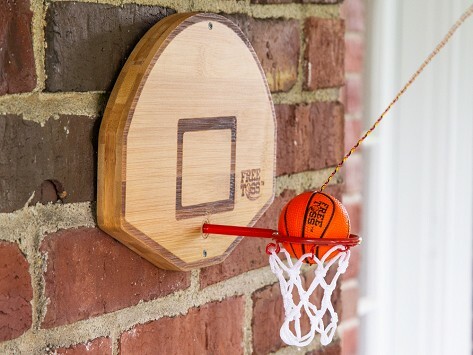 Swing the mini basketball to land in the hoop. Follow the preset scoring rules or make up your own. Dimensions: 9.62" x 6.5" x 0.62"
Tiki Toss is an easy-to-play (and extremely addictive) hook and ring game. It will be a hit with lovers of classic party games like corn hole or ladder toss. According to our research, the original hook and ring game could have originated in Robin Hood’s time. Or maybe it was invented by Hemingway. But the Tiki Toss version we discovered actually started as a smartphone game. Developer Kyle McGetrick wanted to create a simple time-killing app. Before long, Tiki Toss caught on—so much so that fans started asking Kyle to create a physical version. Your goal is to “catch on” too. Set up the Tiki Toss board, swing the ring on a string and try to hook it on the board. Start with the ring closer or farther to vary the degree of difficulty. The board doubles as décor, available in beautiful, 100% bamboo shapes. Set up on a tree in your backyard, an outdoor wall, or even on a rec room wall for indoor play. It’s one way to keep your next party swinging.